Description: This listing is a NIB, red Ruger MkIV 22/45 Lite chambered in the perennially popular .22 LR cartridge. The MkIV is a major improvement in Ruger's line. Gone are the days of complicated and laborious reassembly required on all previous versions of the Ruger Mk series. With the simple push of a button the entire upper receiver lifts up and off the frame! Furthermore, this simplification is accomplished without degrading any of the good attributes of previous versions that have made Ruger's .22 LR pistols justifiably popular for decades. The polymer frame of this pistol copies the angle and excellent ergonomics of the iconic 1911 pistol. The ventilated upper receiver along with a lightweight barrel gives this pistol an amazing overall weight of only 25 ounces! This is an ideal pistol for someone looking for comfortable all day carry, general plinking, or a teaching tool for youngsters. Comes with two 10 round magazines. FEATURES: -Simple, one-button takedown for quick and easy field-stripping with a recessed button in the back of the frame which allows the upper receiver to tilt up and off of the grip frame without the use of tools. 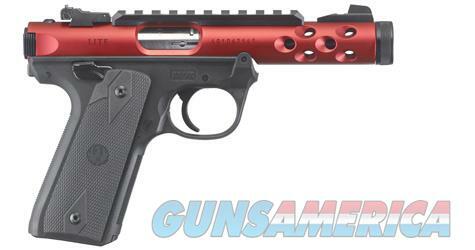 -Receiver is made of aerospace-grade aluminum and is ventilated, making the pistol extremely light. -Comfortable, precision-molded polymer grip frame with a serrated frontstrap and checkered backstrap. -Ergonomic bolt stop. -Checkered, 1911-style grip panels for a great appearance and comfortable, non-slip hold. -Internal cylindrical bolt construction ensures permanent sight to barrel alignment and higher accuracy potential than conventional moving slide designs. -Contoured ejection port and easy-to-grasp bolt ears allow for durable and reliable operation round after round. -Accurate sighting system features an adjustable rear sight and a factory-installed Picatinny rail for easy mounting of optics. -Ambidextrous manual safety positively locks the sear in the "SAFE" position when applied. Safety can be converted to left-side only with included washer. -Features a conveniently located push-button magazine release on the left side of the frame. -Magazine drops free on release for faster reloading.